Who should get a coronary calcium CT test and how is it utilized to diagnose atherosclerosis and prevent heart attacks? In November 2018 the ACC/AHA guidelines strongly embraced coronary calcium scanning for better assessing the risk of intermediate risk patients. I discuss this welcome change here. My most recent post discusses the importance of using coronary calcium scans in youngish patients. 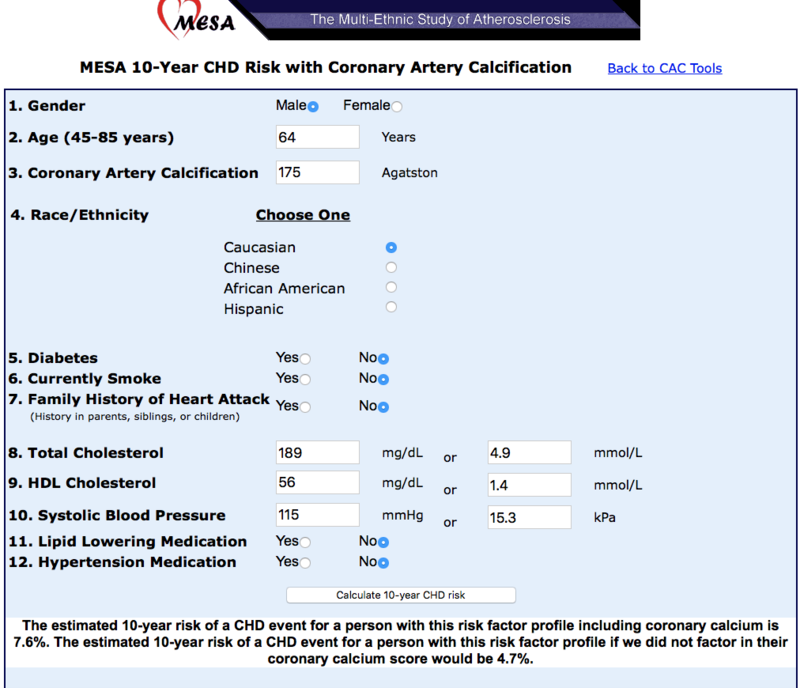 In earlier posts I referenced the ACC/AHA ASCVD risk estimator tool as the starting point but if I have information on my patient’s CACS I use a new and improved tool called the MESA risk score calculator. Is Coronary Calcium the mammography of the heart? The coronary calcium score of Donald Trump versus that of Hilary Clinton. Heroes and Villains in cardiology:The Widowmaker documentary. It’s truly professional negligence that more at risk individuals are not being told to get a Cardiac Calcium Score. Blood tests are virtually worthless compared to this test in predictive value, yet middle aged individuals with clear risk factors go into physicals every year and are not told by their physicians to get this test. Are they waiting for their patients to keel over so that they can charge for quadruple bypasses and stents? Truly unconscionable. At what point do you recommend further testing? At what point does a high score indicate an invasive procedure to check for internal damage? 1. 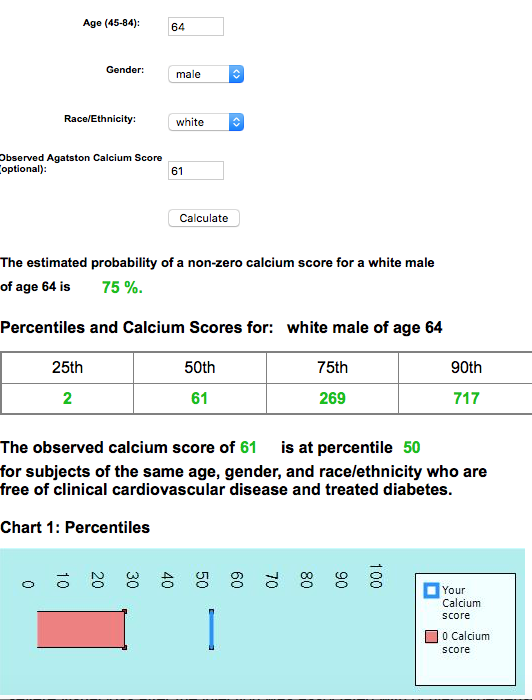 At what calcium score should you get further testing? Some guidelines have suggested stress testing at a score of >400. I can’t make this a blanket recommendation for several reasons. One, stress nuclear tests have such a high rate of false positives in some testing centers that if the patient is asymptomatic, a positive test is much more likely to be a false positive than to actually indicate a problem. Second, a score of 400 in older white males can be normal, thus the recommendation would trigger doing stress testing on all men over a certain age. I’ll ponder this a little further and see if I can develop or find a better approach. 2. I would not recommend an invasive procedure for any level of score. I have lots of patients who have scores well over a thousand and are free of symptoms with normal stress tests. We manage them with statins and aspirin and they do well. A cath or invasive procedure should only be done for significant exertional symptoms or significant ischemia on stress testing. 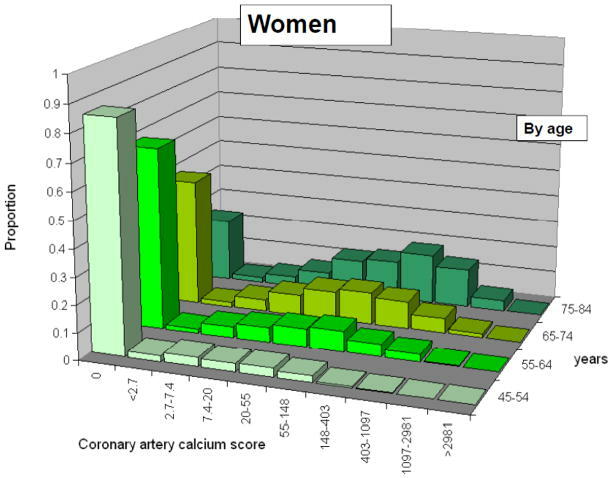 Hello, calcium scores cannot give an accurate picture of heart health. When I was 73 I entered a research program that involved a calcium coronary scan. My score was 1003. No symptoms. Understand, I had been diabetic for 20 yrs and on low carb, high fat diet, basically in ketosis for all that time to solve the problem. I have averaged HbA1c of 5 or lower all these years. I also had been running for nearly 40 years. It was recommend I undergo angiogram to find out the true picture. Result was absolutely no blockage anywhere, no narrowing, in fact the cardiologist remarked the wide open arteries. He was impressed. Four years have passed and I still run (about 2 miles a day), So what is going on here? Good question. I’m actually in the process of preparing a post that discusses the limitations of the “angiogram” (also known as cardiac cath) that you had. You can have lots of plaque in the lining of the coronary arteries both calcified and non-calcified but have no clearly visible impingement on the lumen of the artery. Angiograms are only looking at the lumen:imagine a cast of inside of the artery. I have numerous examples of angiograms that were called normal but if you look at the film before die is injected you can see lots of calcium lining the walls of the arteries. As long as the plaque doesn’t impinge on the inside of the artery and limit blood flow (termed a blockage or narrowing) there are no symptoms even though what we term the “atherosclerotic plaque burden” is high. Despite this, population studies clearly put a score >1000 in a high risk category for risk of stroke and heart attack. Plaques too small to detect on the angiogram can rupture and cause heart attack. Your excellent lifestyle may have prevented the plaque from progressing to cause blockage or heart attack and the high calcium score represents “healing” of pre-existing diffuse soft plaque. Thanks, Dr AnthonyP for your reply. You pointed out a likely ‘healing” process which is exactly the way my cardiologist described it. He even used the expression, like a “tuck and point” a mason might employ to repair concrete between bricks. I don’t know if you or your readers would enjoy hearing about my adventure with the cardiologists who fretted over my high score and lamented my LDL of 160 but seemingly ignoring my HDL of 100 and nearly 0 Trigs. In fact I had to fire two of the statinators associated with the cardiologists who did the angiogram. They insisted I take statins. But the specialist who did the angiogram agreed with me as he saw the proof that something seemed right about what I was doing. I noticed your post on coconut oil. Yes, you could say I drink the stuff. Many eggs. And when I say I’m in ketosis I mean deep ketosis. It gives me extraordinary energy and mental clarity. One other secret and possibly the most important clue to warding off heart disease. At least I have followed this. And that is an abundance of omega 3s. I eat a massive amount of fish, fatty ones including sardines. The omega 6 ratio to omega 3 is 1 to 1 and has been since 2000 when I was diagnosed with diabetes. (This, some of my docs think, was precisely what promoted the “healing” you mentioned, along with the low carb) My GP finds all this very interesting and tracks such things with blood tests. He also is a rare doc who thinks low carb and high fat solves problems. Sorry for the extended remarks, perhaps someone can try the same if they have the problem I had with the diabetes years ago. Glad I found your site, Doc, keep up the good work and skepticism. Though I fear the pressure may mount on you to get in line with standard nonsense the AHA, ADA, AMA teaches. Interesting. I enjoyed hearing of your adventures with cardiologists and your years of deep ketosis. You may have read elsewhere on this site of my “adventures in ketoland”. I definitely have more clarity and energy when i consume lowish carb but it’s interesting how many comments I get from Esselstyn/Vegan readers who feel fantastic on diets that have ultra low fat. Perhaps each individual has to find by trial and error what particular diet works best for their particular condition. I have many readers who are advocates of high omega-3 to omega-6 and personally I minimize omega-6 sources and maximize omega-3 sources. I keep trying to put together a post on this but have failed thus far to come up with any recommendations I feel confident about. Fortunately, thus far I have felt no pressure from organized medicine to tow the party line. I have a friend who has a cardiac calcium score of >600. However, he was in top 1% on his stress test and has no abnormal lab values. He is 51, great shape & never smoked. His BP is mildly high, but controlled with a low dose BP med. He had some “fainting” episodes after exercising recently. He also had an episode where appeared to be having a seizure or TIA. Should he be worried? 1. 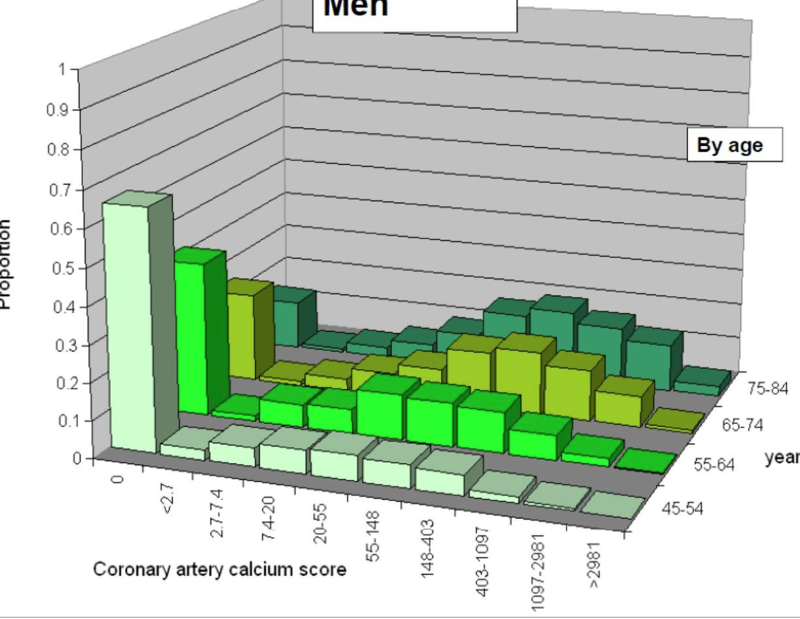 The very high calcium score for age indicating advanced plaque in his coronaries. 2. The symptoms of “faining” on exertion. 3. The possible seizure or TIA. These may or may not be related but definite warrant further evaluation. He should check with his PCP or cardiologist ASAP. My coronary calcium score was 1,327. I just got the results of my nuclear stress test and it was normal. How can this be? I do have an appointment with my cardiologist in 3 weeks.